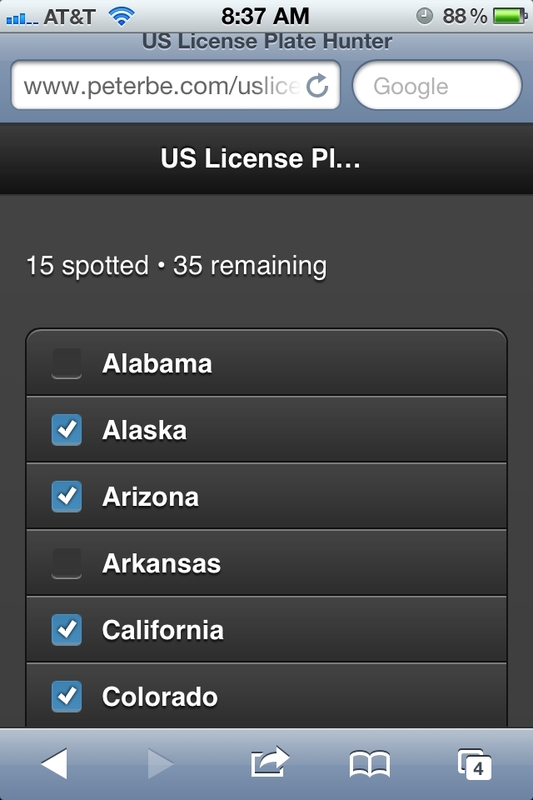 My app that I'm going to build is called "US License Plate Spotter". A dead-simple app where you tick off each US state once you see it. In case you didn't know, in the USA, you mostly see "local" license plates because if you for example buy a car in Micigan but move to California, after about 3 months you have to re-license it with plates from the state you're living in. So here where I live, in California, you mostly see "California plates" but every now and then you see other plates such as Nevada, Washington or Floria. The further away, the less likely to be spotted. This is about 2 hours of work which is pretty quick but it was easy because I've used jQuery Mobile a lot in the past and this was more or less just getting familiar with the recent changes. The app works fine and I even used it this last weekend to keep track of new license plates since Friday. Compile an Android and iOS version with PhoneGap and see if I can launch it in some app stores. Here's part 2 in the series. How about making a WebApp manifest and hosting on the Mozilla Marketplace too? That's certainly on the list. I started with jQuery Mobile because it's most mature and it might win me some time for the Mozilla WebApp stuff to mature just a little bit more. I think you should add to your "next steps" (4) some kind of remote server sync thing. eg. so you could have a database of all people and stats like how many washington plates were seen in total. As an example for the exercise, because it would seem that's a common use-case. In fact, what I intend to experiment with is to use Facebook. In particular, something called Facebook Graph which is basically an API for storing and retrieving stuff. Facebook also solves the authentication problem with cloud storage solutions.